Drivers near Lee’s Summit, North Town, and Overland Park might be looking for a nice, new compact car to make their commute more efficient. Folks in Mission, Olathe, and elsewhere in Missouri may just agree. For anyone who’s considering a small car, the 2018 VW Jetta and 2018 Toyota Corolla are both excellent options in the segment. But which will meet more of your needs? Our team at Volkswagen Lee's Summit has compared the two vehicles in this article. Read on, compare the features you care about, and decide which model makes the most sense to you! The 2018 VW Jetta and 2018 Corolla have plenty of comparable high-tech features, including Bluetooth® technology for hands-free calls and music streaming. Both offer a rearview camera as well to let you see what’s going on behind you, so you can go into reverse without the worry of back-over collisions. 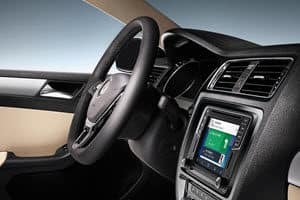 The VW Jetta advantage lies in the infotainment: Unlike the Toyota Corolla, it has available Android Auto™ and Apple CarPlay™ integrations for an easy and intuitive connective experience. Plug in any compatible smartphone and access your music, messages, and more. Power-wise, the 2018 Corolla delivers a solid performance, with up to 132 horsepower and 128 lb-ft of torque from its four-cylinder engine. But the 2018 VW Jetta tops out at 150 horsepower and 184 lb-ft of torque for a bit more accelerative fun behind the wheel. At higher-level trims, the VW Jetta power advantage is even more noticeable. The 2018 Volkswagen Jetta and 2018 Toyota Corolla offer plenty of space for the driver and front passenger to stay limber during long rides. Front headroom is about 38 inches, and front legroom is around 42 inches for both cars. But the Volkswagen Jetta 15.7 ft3 of cargo volume is more spacious than the Corolla’s 13 ft3, and it will let you store more groceries, sports bags, and whatever else you need to transport. If you’re gearing up for a family trip, you’ll be able to fit an additional large suitcase in the VW that you wouldn’t find room for in the Toyota. Was our 2018 Volkswagen Jetta vs. 2018 Toyota Corolla comparison helpful to you? 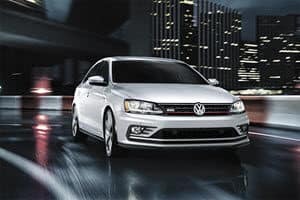 Both are solid, high-performing compact sedans, but when it comes to factors like power, cargo space, and infotainment, we believe drivers from Lee’s Summit, Mission, and Olathe to North Town and Overland Park may enjoy what the VW Jetta has to offer. Schedule a test drive of the 2018 VW Jetta at Volkswagen Lee's Summit today! When you schedule your appointment in advance, we’ll have a shiny new VW Jetta waiting and ready to go when you arrive. 128 city/40 highway mpg (2018 Jetta 1.4L, 5-speed manual transmission). EPA estimates. Your mileage will vary and depends on several factors, including your driving habits and vehicle condition.